Last month I had the opportunity to try something new from Missha, one of my favorite Korean skincare brands, courtesy of 0.8Liter. Usually I like to wait until I have at least six weeks use under my belt, so my eagerness to report back sooner indicates either a thrillingly bad product or an exceptionally great one. It's the latter in this case. 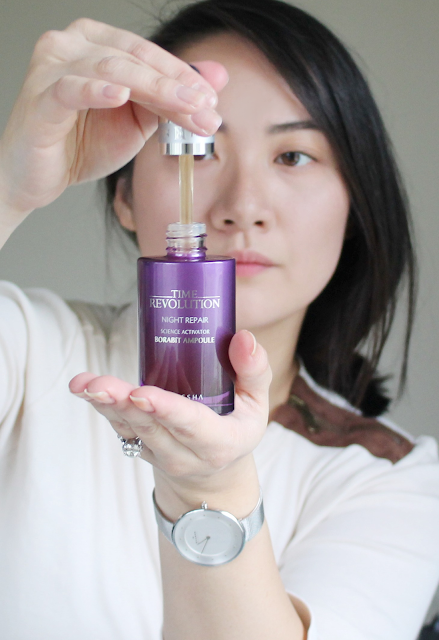 Missha Time Revolution Night Repair Science Activator Ampoule is certainly a mouthful, but it's quickly become one of my favorite skincare products. I'm going to refer to this product as Purple Ampoule from here on out, for simplicity's sake. The ampoule comes in a pretty pink-purple gradient bottle with a dropper top. There's a very, very faint scent- I think it smells like bitter greens. 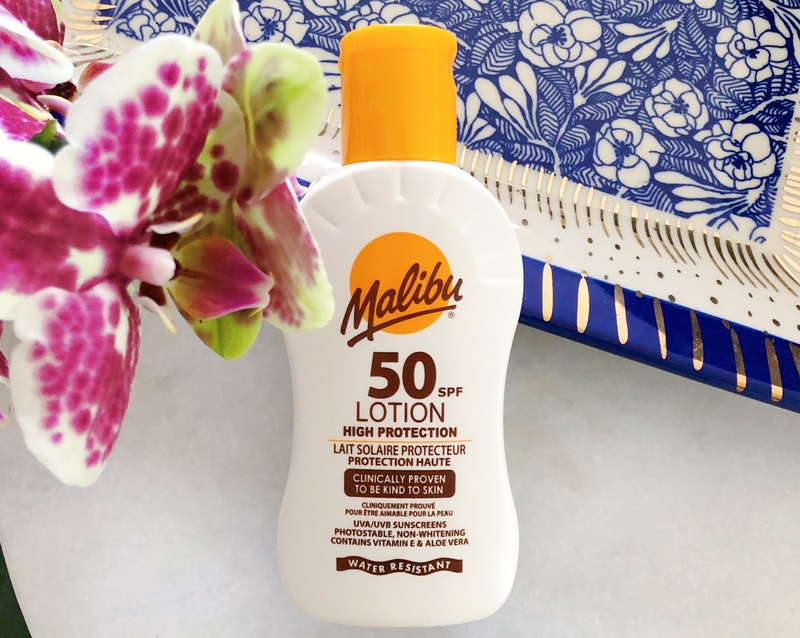 I very patiently patch tested this product, and I found that each day I couldn't wait to expand the area of my face on which to apply this stuff. Now, Purple Ampoule manages to feel sticky AND oily at the same time, two attributes that I previously considered mutually exclusive. On top of that, it's rather slow to absorb into the skin. I would absolutely not recommend wearing this during the day as upon initial application it makes the skin look incredibly shiny. If you're wondering if it's the kind of shiny that other people notice, I would say that it is. The other night we were getting ready to watch an episode of The Man in the High Castle (season 1 was excellent, I'm having difficulties latching onto 2) and as this is frequently when I mask to unwind, I went ahead and cleansed my face. After adding a couple drops of Purple Ampoule, I plopped down on the couch next to my dear husband. "Whoa, why does your face glisten like that in the light? Why is your skin so greasy late at night?" He doesn't sugarcoat it, that man. Now never mind how my skin feels kind of tacky and slick as I'm going to sleep, what you really should know is what my face looks like in the morning after it has sunk in. The difference is amazing, like I mentioned in my quick IG review, I can go to sleep with rough, raggedy looking skin and wake up to cheeks that are absolutely sleek and plump. I find that I use about half a dropper full for my face and neck. This ampoule moisturizes, smooths and firms all at the same time. Think textural changes, not differences in brightness/skin tone evenness/hyper pigmentation. I actually think that my face looks the best in the AM now, the face that I see in the mirror first thing is perhaps at its peak. Despite the oily and sticky texture at night, I wake up in the morning with very balanced skin - not one bit of excess oil. I didn't really think to take "before" pictures as I wasn't expecting the sort of difference that could be captured in a photograph. You know how sometimes you'll see a before/after comparison and it just seems like the "after" photo was taken in better lighting? Minor changes in lighting conditions seem to make more of a difference in photos than anything. I'd like to invite you to take a peek at the naked face picture from my [innisfree] No Sebum products post here, as that'll give you a good idea of the kind of micro bumpy texture issues I have. Here's a shot of my naked face in the morning, after using Purple Ampoule overnight. Completely unedited photo. While truthfully this ampoule doesn't eliminate the cause of the micro bumps, it does provide a solution - plump, firm skin hides those textural issues quite well. Newcomers to the increasingly complex kbeauty skin routines might want to know, where in your regimen you would use this. While ampoules seem to be recommended before serum, I like to use two guidelines: thin to thick and water before oil. That puts this ampoule after my serum and the gel like CosRX Ultimate Overnight Honey Mask (review here) that I've been using as moisturizer. I've tried using the ampoule before serum and gel, but then I have issues with those products not absorbing. Since my skin is combination and my dry parts have been, well, really dry lately, I will follow up the ampoule with a cream (Dr Jart+ Ceramidin Cream) to seal it all in. I would call this overkill for those living in more humid climates than I, or with other skin types. So far I've used this product for a month, even with generous use I've only finished about 1/5 of the bottle. Missha Time Revolution Night Repair Science Activator Ampoule is $49 and available from Target.